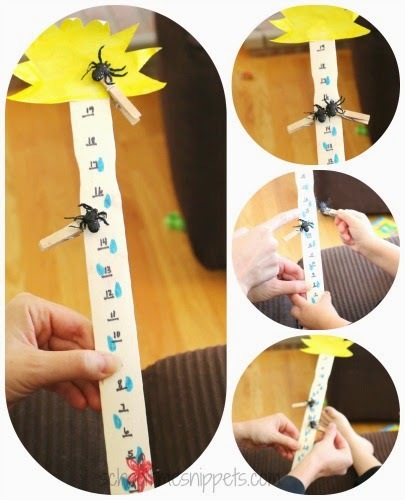 Learn the numbers 1-20 with this creative Incy Wincy Spider Game! In this dice game, your spider piece needs to be the first to get to the top. Preschoolers will love playing this nursery rhyme inspired game! Is it Incy Wincy Spider? Or Itsy Bitsy Spider? Or Eency Weency Spider?! I'm familiar with Itsy Bitsy, but I know the nursery rhyme goes by any of the other names, too. How in the world did such a simple rhyme get called so many things?! For our second week of Playful Preschool, I set up learning activities with a nursery rhyme theme. Other nursery rhymes activities were inspired by: Five Little Monkeys, Twinkle, Twinkle Little Star, and Three Blind Mice. 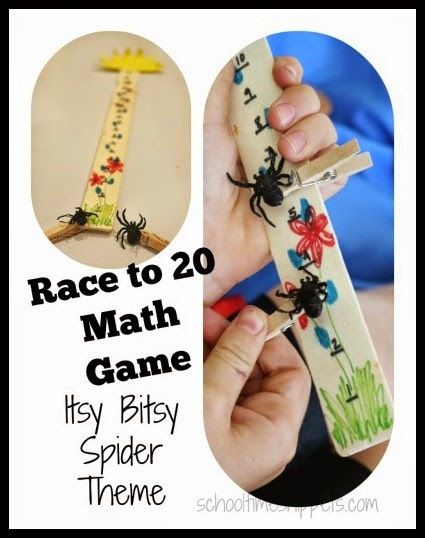 This math game was inspired by Incy Wincy Spider. This clever math game uses a paint stick (aka paint stir stick) as the "gameboard." The paint stick is the "water spout" in the nursery rhyme! 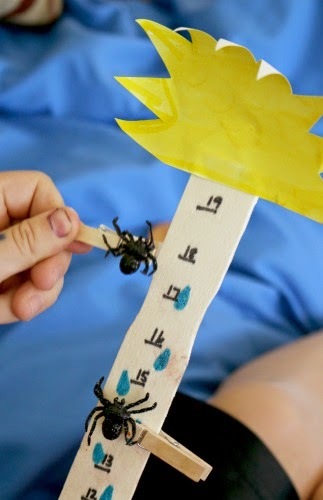 First, you'll need to decorate the "water spout," i.e. paint stick using markers. I drew raindrops and some flowers on our paint stick. On a separate piece of paper I drew a sun, cut it out, and glued it to the top of the paint stick. Our paint stick was long enough to make 20 marks, which I kinda eyeballed.. but you can choose what number you'd like to "race to" and fit the numbers on the paint stick accordingly. Next stick the adhesive spider stickers to the clothespins. Grab someone to play with and you are all set! Simply roll the die and move that many spaces "up the waterspout" (ie. paint stick). First to reach the sun, wins! Oh, and bonus that this math game is also working on fine motor skills! I can see this game being made up for many more themes! Have fun playing! ** If working on basic addition skills, you could make a die with addition facts on them for your child to answer OR roll two dice and have your child add the numbers together to move up the paint stick waterspout! ** Now that you made it up the paint stick waterspout, "down comes the rain".... play the game backwards and see who makes it down the paint stick waterspout first! ** Don't forget to sing this simple nursery rhyme, too! Sang 5 Little Monkeys Nursery Rhyme and wrote M's all over a chalkboard that Little Sis 'erased' with water and a qtip. Borax and Glue Gak; we used black colored glue and sang "Twinkle, Twinkle Little Star"
Fall Leaf Rhyme; as I said the rhyme all three kiddos threw leaves bought from the craft store into the air. We "raked" them up with our fingers, and did it all over again! In case you missed it, check out our first week of Playful Preschool Spice Up Your Name Activity for our Five Senses theme! Plan your preschool year, too with our Weekly Theme Ideas & Printable Planning Sheet! 1 comment on "Incy Wincy Spider Dice Game "